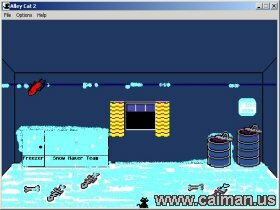 Caiman free games: Alley Cat 2 by The Thinker. 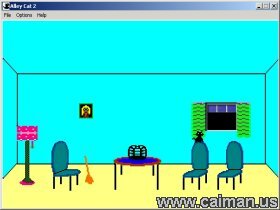 In the main screen, the "alley", the player is presented with the outer facade of a house with several windows, which periodically open to throw out random objects. By jumping and climbing trash cans, the fence, and clotheslines, the cat can enter various rooms through these windows, and each room contains several challenges. In all of these rooms, successful completion of the task is awarded with an amount of points . The cat starts off with three lives in normal mode, and a life is deducted if one of the enemies (like the spider, an electric eel, etc.) is touched, or if the cat is hit by one of the objects that fall out of the windows in the alley. Most of the time, the only way to escape a task without losing a life is to jump back out of the window, but this is not always possible. These areas switch between one status and the other as they are touched by heart-shaped arrows that are constantly shot diagonally across the screen. These arrows also cause the player to fall down a level. There are also gift-wrapped presents on the bottom row that could be used to eliminate an unfriendly cat. If the player falls from the bottom row, they fail and must return to the alley and complete another task. In the alley, every once in a while a dog may come running along the bottom edge of the screen. If the cat ever touches this dog, they get into a fight and gradually move off the screen. One life is taken away if the cat gets into a fight with the dog. Most rooms also contain a broomstick that appears to move on its own. The cat can make footprints at the bottom edge of the screen to keep the broom busy with cleaning them up. While there are no footprints, the broom will constantly go after the cat. It is harmless in the sense that it never kills the cat, but it pushes the cat around, enough to make it more difficult, rather impossible to complete the task if the broom is not kept busy. In particular, it might often throw the cat right at the above-mentioned dog, or out of the window. If the cat manages to kiss the female cat in the special room, the player gains an extra life and extra points. This continues indefinitely and the goal is to see how far one can go before running out of lives. 'Cause Alley Cat is very dynamic,very funny and never boring. I remaked this game 'cause no one else did it, for the love of programming and of course to make my special tribute to Bill Williams the original maker of Alley Cat. If you want to make more Alley Cat remakes, visit my site http://asetgames.altervista.org and you'll find all you need to start your game! Alley cat is originally created by Bill Williams in 1984. Those wwere the days where we play pc games using floppy disks and in dos mode. There are no windows at that time. Playing this game will bring back to a lot of childhood memories. If you are not that old, still a youg lad, no worries, you can still enjoy this well done remake. You control a cat , just keep moving and get bonus items to see how long you can last. There is no ending in this game , just the high scores you need to beat yourself.Overal, this game certainly have the features of the old games and have improved features. If you want to play the older version, you can visit the author homepage for download.